Coming with the rich culture & tradition in India, Chanakya is known to be one of India’s First notable Strategist & Kingmaker. For the first time in History, Chanakya’s Construct (Model) for running a Sound & Successful Kingdom, has been applied to Modern Day Management & Business Skills. 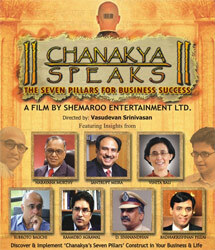 This Inspiring Film, unveils to the world, ‘Chanakya’s Seven Pillars’ for Business Success, through the gripping story of a young manager who takes a journey into the teachings of Chanakya while interacting with prominent Business Gurus to prove that Chanakya’s teachings are Eternal & Relevant even today. The story revolves around the quest of a young business executive trying to rediscover Chanakya&apos;s Teachings. 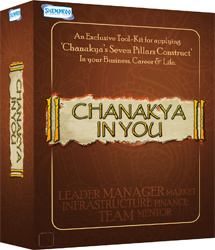 Mentored by his quirky “boss”, he discovers Chanakya&apos;s Seven Pillars Construct (Model) and sets upon a journey to apply the learnings, for the growth of his organization and betterment of his own life. In this interesting journey he makes opportunity to meet face to face with some of India’s most successful leaders in business and otherwise: Mr. Narayana Murthy; Dr. Santrupt Misra; Vinita Bali; Subroto Bagchi; Raamdeo Agrawal; D. Sivanandhan. He realises, that Chanakyas teachings are still very relevant and pertinent in the current business context both in letter and spirit, helping him to set a new direction for himself and for his company. Chanakya, who lived in 3rd Century BC, was a leadership guru par excellence. His ideas on how to identify leaders and groom them to govern a country have been well documented in his book Kautilya's Arthashastra. 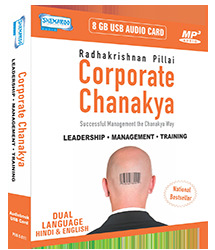 In this Audio book series the author simplifies the age-old formula of success for leaders of the corporate world through 'Successful Management the Chanakya Way'. Leadership: It has 70 chapters which talk about Power, Qualities of Leader, Competition, People and What a leader should not do. Training: It has 35 chapters which talk about Employee Training, Training to Higher Authorities, Organization and Advice. Part One- Leadership: It has 70 chapters which talk about Power, Qualities of Leader, Competition, People and What a leader should not do. Chanakya, who lived in 3rd Century BC, was a leadership guru par excellence. His ideas on how to identify leaders and groom them to govern a country have been well documented in his book Kautilya’s Arthashastra. 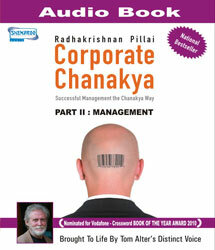 In this Audio book series the author simplifies the age-old formula of success for leaders of the corporate world through 'Successful Management the Chanakya Way'. Part III: Training: It has 35 chapters which talk about Employee Training, Training to Higher Authorities, Organization and Advice. and The Way You Live. Based on the hugely popular book by best-selling author Deepak Chopra, HOW TO KNOW GOD is an exciting, insightful journey towards a better understanding of one of life’s greatest mysteries. Uniquely blending science and philosophy, Chopra offers such an inspiring approach in spiritual thinking, that any viewer, regardless of faith, can undergo a profound quest “to know God”…and attain a new concept of what they think they know! And ultimately, through Chopra’s brilliant narration, one may come to understand that the quest for God is really a journey in self-understanding. Thought-provoking, practical and thoroughly entertaining, this material, presented by one of the most advanced thinkers of our time, is perhaps the most uplifting DVD you’ll ever bring home!"